*** ADULT DOGS: 1.5 year old Young Male Coming Soon!!! *Important FYI: *CLICK HERE* for Questions/Info Growth Process:"CLICK HERE FOR GROWTH ANIMATION"
Pigment Process:"CLICK HERE FOR PIGMENT ANIMATION"
Step 1: Scroll Down to see/read what we have AvailaBULL here on this page. Step 2: Read our *** Puppy Info/About Us *** page for more info/details. Step 4: If we have what you are looking for after we receive your Questionnaire we can set up a time to chat to discuss things further, it is pretty simple.These days many breeders don't even want to talk to you, just text or email or DM's... huh? Not the way we do things, we actually want to speak to anyone adopting our babies. 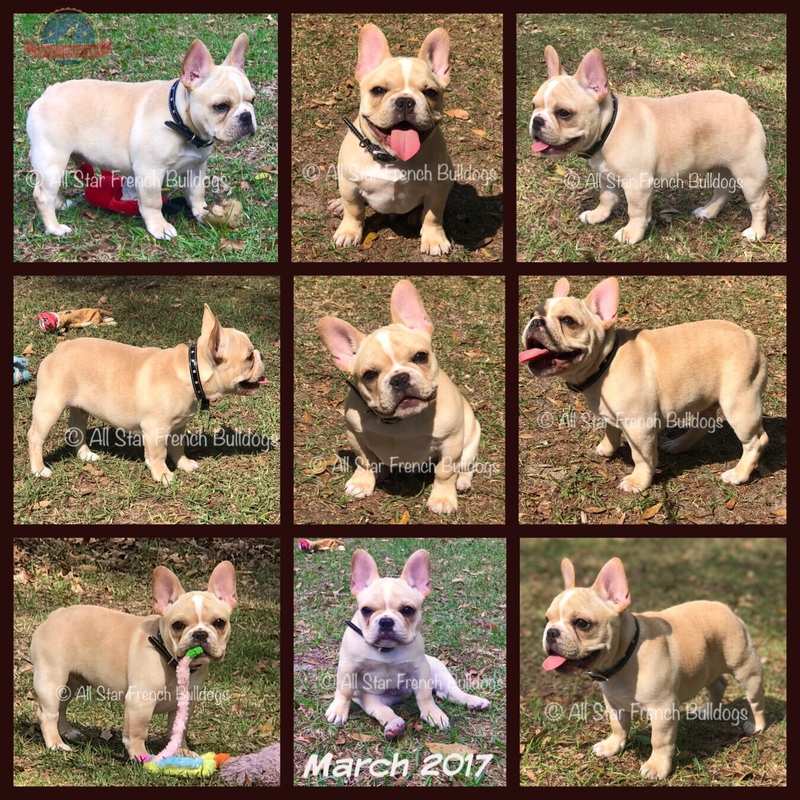 Our site is 14+ years old, it is big and an older site before mobile sites were a thing, but there are just just a few pages that are a MUST READ if interested in our French Bulldog Puppies. Of course our HOME PAGE, this page here to see what we have Available ... and the last page for Questions...Are your dogs AKC? What do they come with? Most questions will be answered on the [PUPPY INFO/ABOUT US Page]. 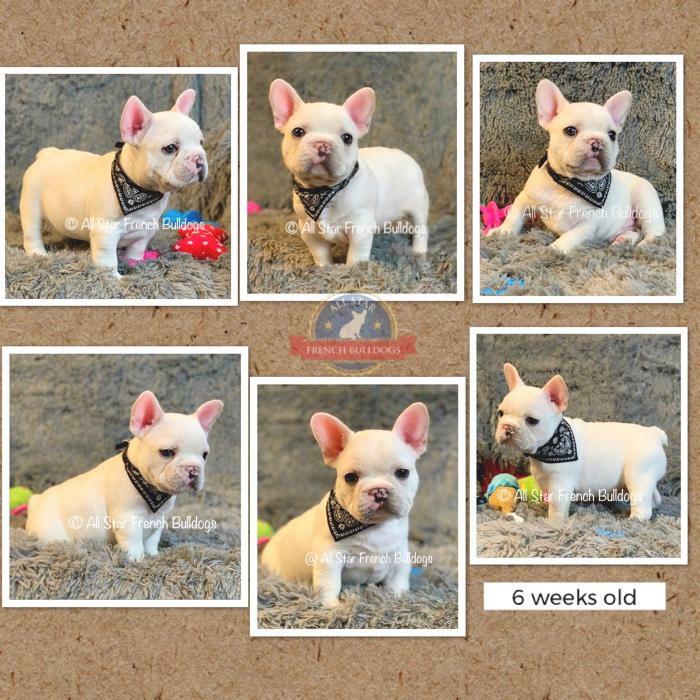 We also have a French Bulldog COST Page you should take a look at and a SHIPPING Page. 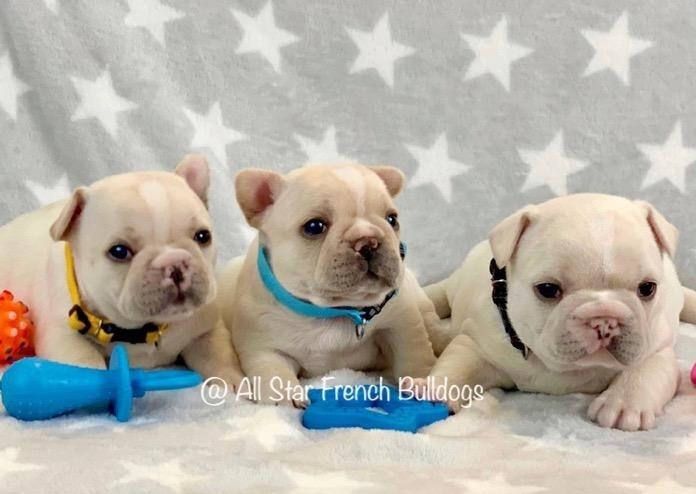 Why do PROPERLY Raised AKC Champion Bred French Bulldogs Cost So Much??? NOTE: Inquiry Emails regarding adopting a puppy with no Questionnaire will not be answered. If you are seriously interested, this should not be an issue. 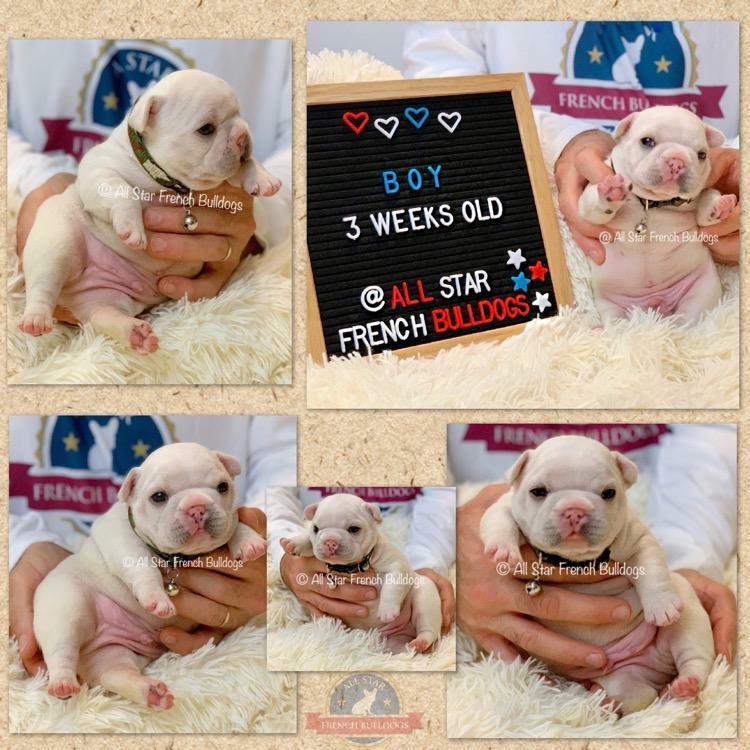 email: frenchies @allstarfrenchbulldogs.com ... Email is all together NO SPACES in EMALS people!!!! *Shipping Info: "CLICK HERE for SHIPPING PAGE", No Dogs/Puppies will ever be shipped!!!! It's just too dangerous and many deaths have occurred, just recently and was all over the news. There are many ï¿½breedersï¿½ popping up everywhere these days, pretty crazy where the breed is headed. Many of them ship worldwide, which is crazy IMO. We will NOT ever ship any dog/puppy as CARGO. Many use a private "puppy/dog" service or a so called "puppy nanny" or "agent" that will fly with the puppy. Things can go wrong, we have heard the horror stories believe me. THAT IS NOT FOR US!!! NO MIDDLE MAN = NO RISKS !!! If you want a puppy/dog from us we must meet face to face & personally hand you your puppy/dog, what better way!!! To see how "Shipping/Pick Up" works and see many photos of our babies being picked up by new families, etc... ... Look on our *SHIPPING PAGE*, it is a VERY simple and EASY process. to ponder (and research) ... thats all. French Bulldogs donï¿½t carry the gene for merle. 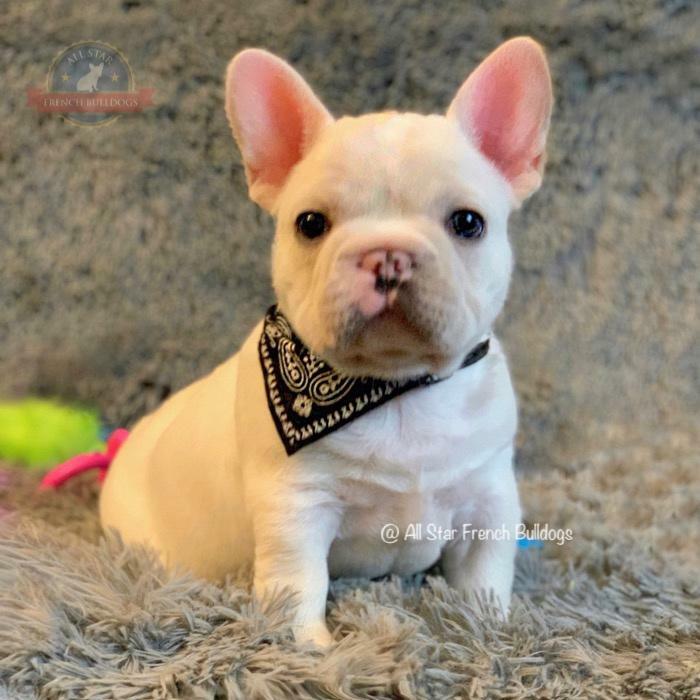 The Merle has been introduced into Frenchies by breeding French Bulldogs into breeds carrying the merle allele, Chihuahuas most commonly "quote by frogdogz. 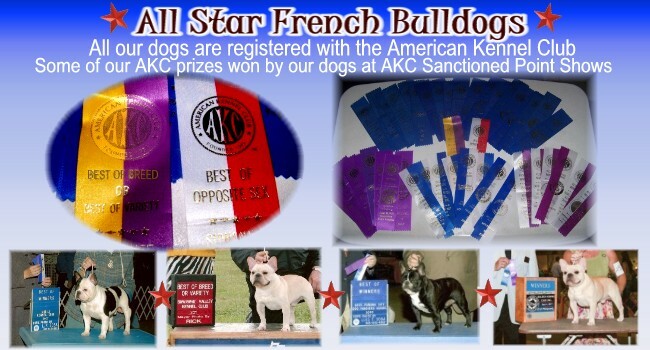 Our dogs are strictly AKC bred and AKC Champion Bred... not CKC, not ANKC, not Bully breed shows, only AKC Standards here. Please only inquire if READY AND COMMITTED to have this baby in your home in March 2019. We are looking for the RIGHT PET HOMES, not just ANY HOME. Our pups are NOT being placed as BREEDING dogs only . Only responsible, loving and forever homes need apply. A puppy is a serious commitment, please do your research and educate yourself on how to properly raise a puppy, especially brachycephalic breeds & their potential breed related issues. If you can provide a loving and forever home and would like to discuss adopting one ****PLEASE FOLLOW ADOPTION PROCESS **** .....See Section at the beginning of this page. Seriously Interested??? Follow our *ADOPTION PROCESS* which is to read our info and send your questionnaire, simple!!! A beautiful cream baby boy with a white stripe face marking, hard to see his white stripe face marking in current photos because of the lighting, but you can see in the video... Such a sweet face, thick, blocky head and just adorbs. Silly, funny, playful and confident little baby. I was calling him Tubby, but I feel Chubs fits so much better. >>>>FACE PIGMENT: The Pigment (darker color) that ALL dogs have around their faces ... ***nose, lip, chin, muzzle*** area takes TIME to FILL IN on the light colored puppies ESPECIALLY those with the flashy white facial markng like this baby.... .The pigment on his face is filling in which is the process at this age for light babies.... This is NOT A BLACK MASK, just pigment like their mom and all dogs have on their faces... see MOM pics below and in videos also. Check out the PIGMENT ANIMATION SECTION *CLICK HERE* that I made to show samples of the process. All photos are of the SAME puppy! PHOTOS are CURRENT & what he looks like now! THE BOYS IN YELLOW COLLAR AND BLUE COLLAR ARE ADOPTED!!! 16 days old... The just sleep and nurse at this age. "Many dogs grow up without rules or boundaries. They need exercise, discipline and affection in that order. The dog is a reflection of your energy, of your behavior. You have to ask, 'What am I doing?' That's the right question to ask. I rehabilitate dogs, I train people. I am the dog whisperer." Thank You for your interest in our AvailaBULLS and Best Wishes in finding your perfect frog dog! Some puppies have their pigment filled in at 2 weeks, some at 4 weeks, some at 4 months and by a year old it should be done, but even then you have your exceptions and we provided that here with the photos of "Olive". I used different color dogs and different amounts and areas, so people get an idea. No more having to answer the same question, now you can see for yourself. Just look at the logo on the right.... there are 7 dogs total, the logo will flip continuously. 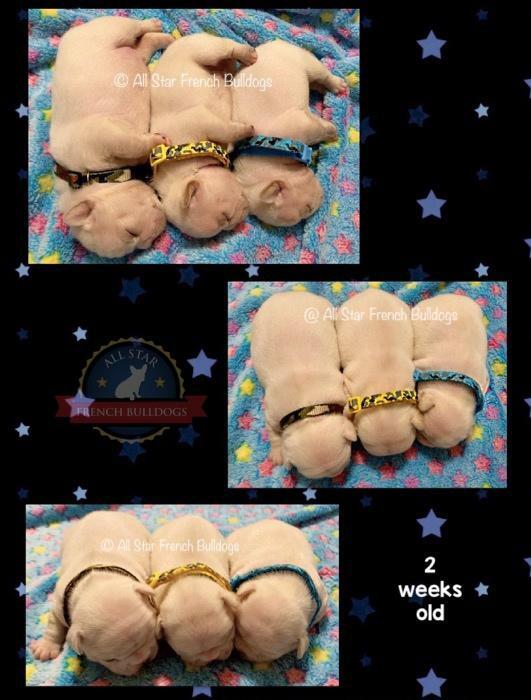 I understand those who are not breeders do not know the process, but we do have a page with our past litters that show the progression of our pups, but we still get questions about this. I have animated 4 of our own puppies below as a sample of what they looked like at different ages starting at birth until at least a year old... Hope this helps! 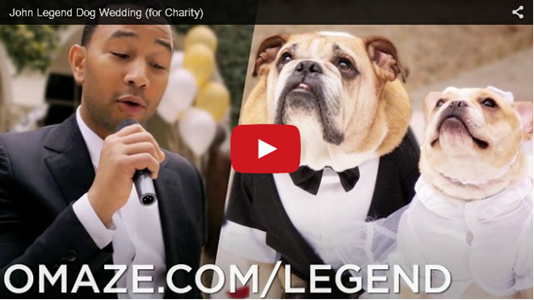 John Legend singing at the wedding ceremony our his English Bulldog Puddy and his French Bulldog Pippa. Pippa is an ALL STAR Frenchie bred by All Star, born at our Vet and raised until she went home to live with her new parents. The video was made to support Johnï¿½s Omaze campaign. Click the Photo to see the adoraBULL video and support if you can. The next photo is the day they we met and handed little Pippa over... that is Chrissy Teigen, Johns beautiful wife, holding little Pippa at the Airport. Photo taken by ALL STAR. 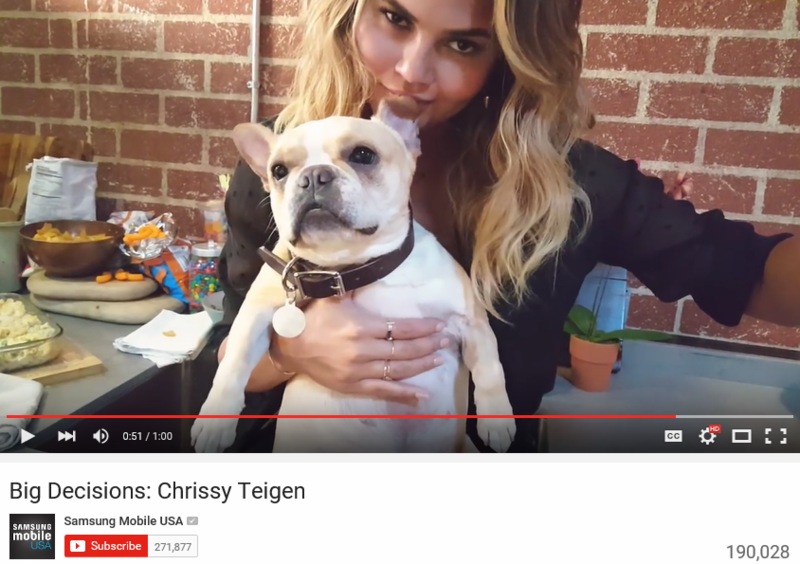 She's right next to Selena Gomez... She was also on E News... too much, just too much ha ha.
.::[Show Photos] [Fun Photos] [French Bulldog Grooming] [Frenchie Aggression] ::.
.:: [French Bulldogs in Water] [Why Frog Dogs?] 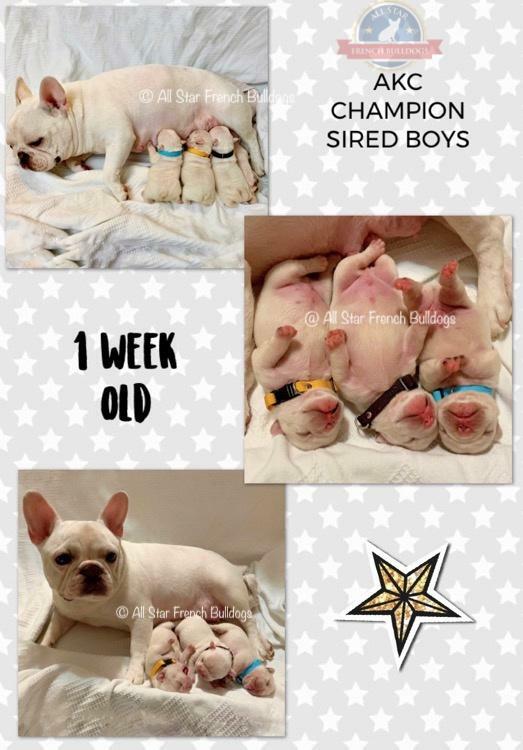 [French Bulldog Info]::. 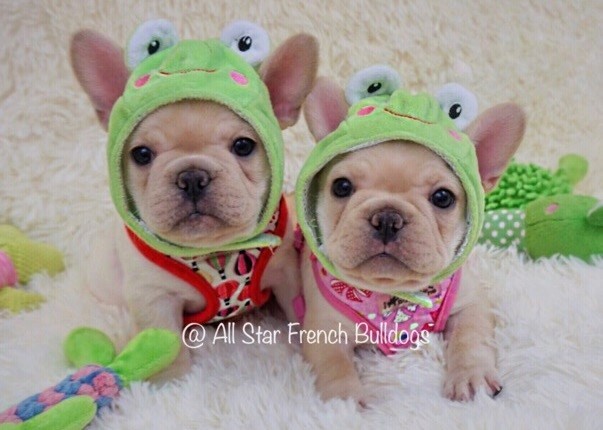 Why do French Bulldogs Cost So Much?? ?